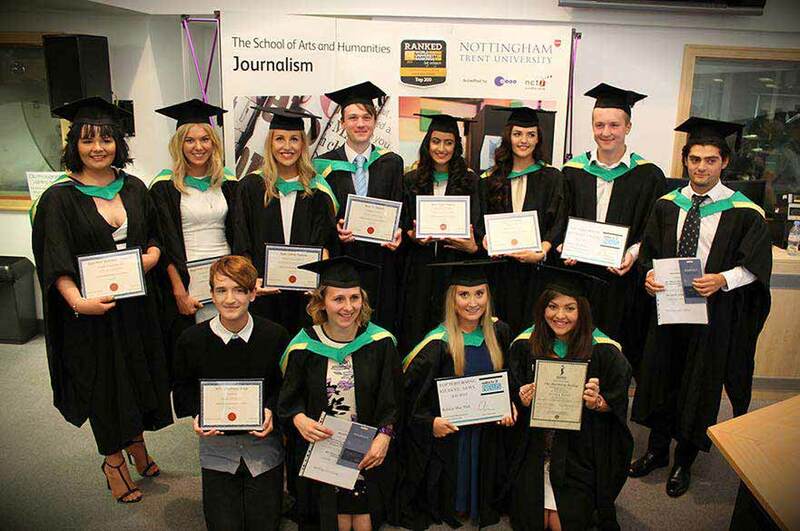 Top bosses from national and regional news organisations have recognised the professional quality of work by Nottingham Trent University journalism students at an annual awards ceremony. Seven industry leaders from print, online, radio and TV newsrooms were invited to judge the final-year features and portfolios of students graduating from the University's Centre for Broadcasting and Journalism (CBJ). The representatives were from Notts TV, Nottingham Post, BBC Radio Nottingham, GEM 106, Sheffield Star, Mansfield Chad, and ITV, all organisations with which the CBJ students regularly secure placements and often permanent jobs. The prizes were given on graduation day and included Best TV Report, Best Radio Report, Best Radio Feature, Best Online Feature, Best Print Journalism Portfolio, Best Print Journalism Feature and Best Student overall for both the Print and Broadcast courses. Mike Blair, who is Executive Producer at ITV's factual production company Shiver, awarded the prize for Best TV Feature to Savanna Nolan for her documentary on the state of mental health provision in prisons. It's great to see strong local journalism being done well. He said: "It was an extremely difficult choice but this feature showed great journalistic instinct. It is incredibly difficult for journalists to secure access to stories about the prison service let alone interview people who have or have had severe mental illness. This piece had it all." Awards were also presented to two journalism students who have been working as interns for Notts TV, which this week launched on Sky channel 117, as part of an innovative Journalism at Work module throughout their final year of study. Daniel Robbins, from Pinxton, Derbyshire, won Top Performing Online Student, for his work helping to launch Notts TV's news website, while Bobbie Hall (21), from Coventry, won Top Performing Student, for her work with the station's news team. Both awards were presented by Notts TV news editor, Chris Breese. Jessica Twist, from Worcestershire, won the Soroptimist Award from Nottingham Soroptimist Society Club President Audrey Jones, for her feature exposing the hardships of women and girls working in the modelling industry. The final award, described as "bitter-sweet" by CBJ director Carole Fleming, was made in memory of long-serving CJB engineer Steve Coates who died suddenly in November 2014. Steve had been a dedicated member of staff who had helped design and build CBJ's student newsroom, radio studios and TV gallery and studio, which are also home to Notts TV. For me the most important thing is the ability to tell a story well and these portfolios demonstrated that. Course rep, Elana Campbell, from Bristol, received the award for her exceptional work in helping other students and in supporting the course throughout her three years of study. Notts TV Channel Director, Jamie Brindle, said: "It's great to see strong local journalism being done well." BBC Radio Nottingham's acting News Editor, Lewis Scrimshaw, said: "Asking difficult questions which people don't want to answer is very important in society and we need more young journalists with the training and skills to do this." Mike Sassi, Editor of the Nottingham Post, said: "For me the most important thing is the ability to tell a story well and these portfolios demonstrated that." 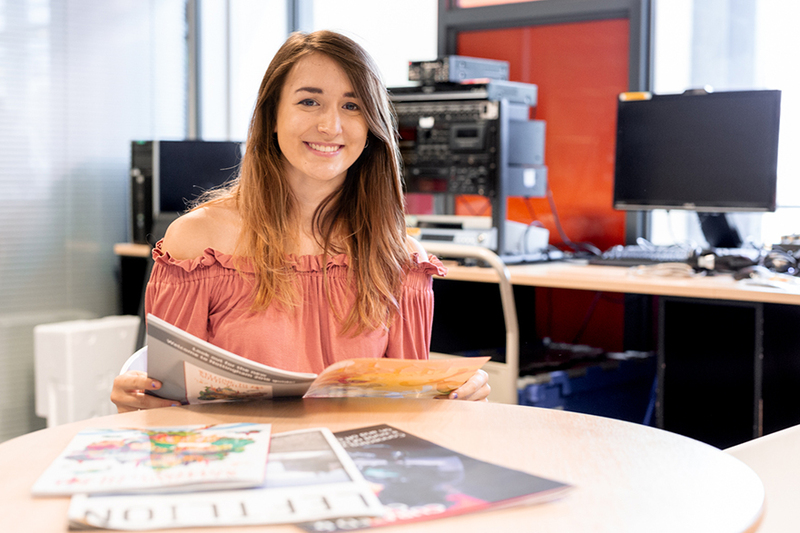 Journalism courses at Nottingham Trent University were recently ranked in the top 200 in the world in the QS World University Rankings® by Subject, while the Print Journalism degree has been voted Best Performing National Council for the Training of Journalists course for three years running. The winners were selected from the 100 students graduating from either of CB’s award-winning Broadcast Journalism or Print Journalism degree course this summer. Jamie Griffiths (21), from Sutton in Ashfield, won Best TV Report, presented by Jamie Brindle from Notts TV. Savanna Nolan (20), from the Isle of Man , won Best TV Feature, presented by Mike Blair from ITV. Nikhita Keshwara (20), from Lincoln, won Best Radio Feature, presented by David Lloyd from Orion Media which owns GEM 106. Polly Bayfield (21), from Northampton, won Best Radio Report, presented by Lewis Scrimshaw, from BBC Radio Nottingham. Hollie Ackroyd (21), from Corby, won Best Print Journalism Feature from Phil Bramley, former editor of the Mansfield Chad. Georgia Farquharson (21), from Aylesbury, won Best Online Feature, presented by Ben Green, acting head of digital at the Sheffield Star. Abigail Smith (20), from Litchfield, won Best Print Journalism Portfolio, presented by Mike Sassi, from Nottingham Post. Jessica Twist (21), from Worcestershire, won the Soroptimist Award (from Nottingham Soroptimist Society club president Audrey Jones) for her feature exposing the hardships of women and girls working in the modelling industry.